Technology designed and created in Knaresborough will form part of a top new attraction at the UK’s most popular theme park, Alton Towers. 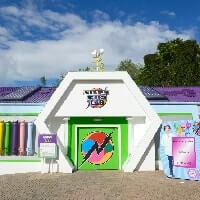 Apollo Creative has supplied four bubble tubes – colour changing bubbling columns of water – to Alton Towers Resort for the new CBeebies Land, which opened on May 24. Ben Johnson, a product specialist at Apollo Creative, said: “We were first contacted by Alton Towers Resort in mid-January when they were looking to source some bespoke bubble tubes for the Nina’s Science Lab area, both inside and out. Although Apollo Creative has extensive experience in creating bubble tubes, they are traditionally used in environments such as sensory rooms. Recently, there has been increasing demand for them to create exciting and enticing displays. Ben added: “We’re seeing a growing interest from retail display and exhibition markets as companies look to draw more attention to their products and company by standing out from the crowd. The contract with Alton Towers Resort allowed Ben and his team to further develop the technology for outdoor use, such as making them waterproof and including much brighter LEDs. Dave Reynolds, entertainments assistant technical manager at Alton Towers Resort, said: “It has been great working with Apollo Creative – we were kept informed of their progress throughout the order. “This meant that when our order arrived we were confident that there would be no surprises. We were also able to connect it to our existing lighting system, meaning we could control the colours to match all our other lights. “We’re very happy with the finished product and love how the display looks”.